The Toronto condo boom might be showing signs of slowing, but 2014 still yielded a bumper crop of quality residences. From the architecturally stunning final phase of the River City project to the triangular Howard Park condos on Dundas St. W., many of the buildings we'll see rising out of the ground in the next few years will become welcome additions to the city's increasingly eclectic skyline. 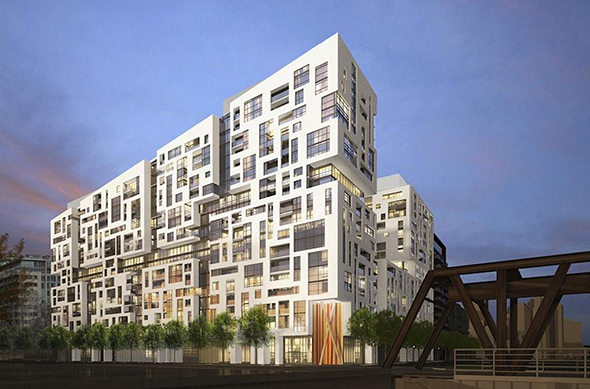 Here are my picks for the top condo developments of 2014 in Toronto. Nothing in Toronto will look quite like the completed third phase of the River City project. Part of the mass revitalization of the West Don Lands, the condo looks like an enormous uneven stack of boxes on one side and a conservative office tower on the other. Viewed in context with the wider development, River City Phase 3 will form part of a dramatic and imposing gateway to downtown. A pleasant break from all the high-rise glass and steel developments in downtown Toronto, the Minto Westside, which tops out at a modest 20 storeys, looks set to be a heavily stylized, campus-like property. There will be an internal, one-acre courtyard and some of the properties on the lower level will open out onto the street. Kingston Rd. 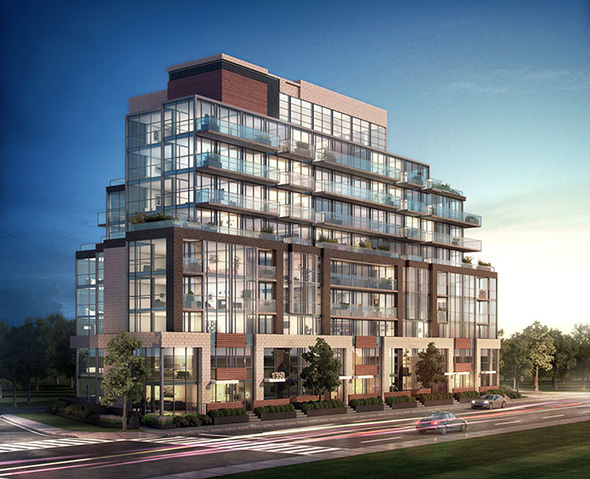 in the Upper Beaches is slowly attracting more attention from condo developers. Kingston & Co., a neat little mid-rise building planned for the north side of the street just east of Victoria Park, looks set to bring new life to the stretch of the historic arterial road still served by streetcars. Even though the building will top out at 10 storeys, south-facing units will have uninterrupted views to the lake, which is definitely a selling point. Office buildings don't often get retrofitted for residential use, so 488 University promises to be something of a novelty when it's completed. 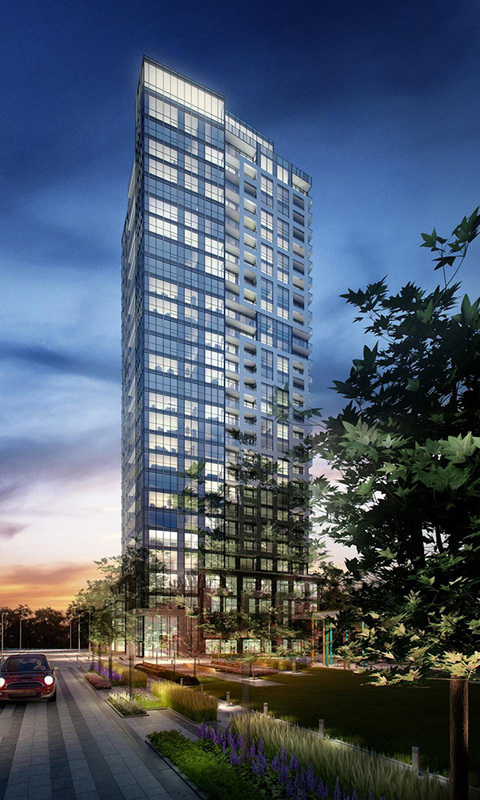 The project will extensively alter the existing 18 storey building at the corner of Dundas and University and add a new tower to the top, bringing the total floor count to 55. 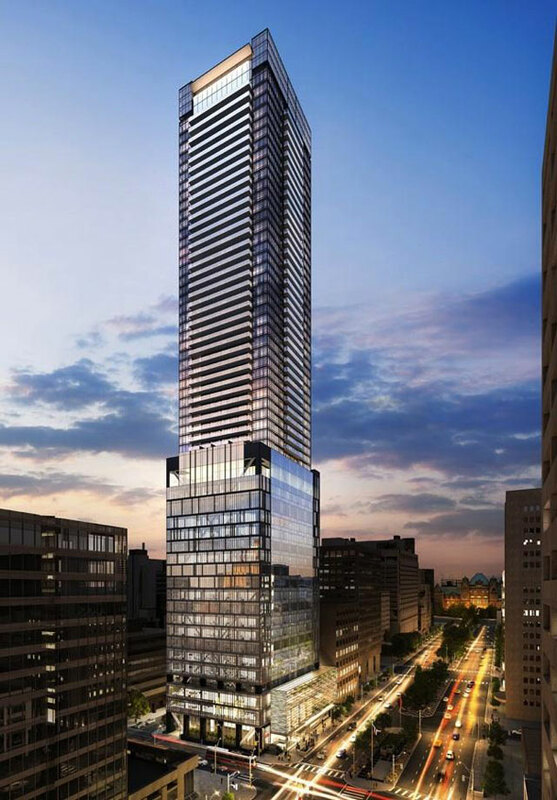 Expect the 453 upscale residential units, a rarity on Toronto's grand downtown avenue, to be marketed to people with money. The nearby Aura condominium might be bigger, but the neighbouring YC Condo planned for Yonge and College is (arguably) visually superior. The black and white tower, which looks like it is built out of individual blocks, is being designed and developed by the same companies as Aura. 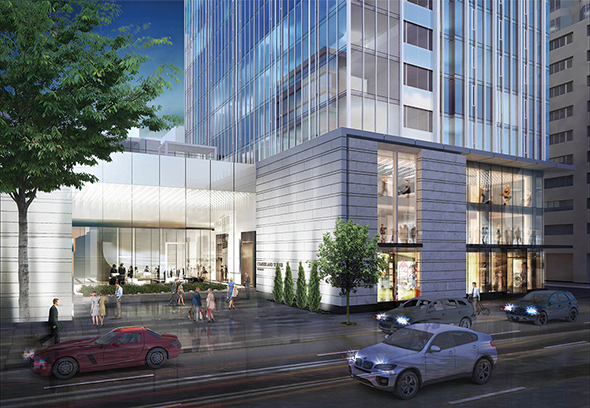 When it's finished in 2017 or 2018, it will rise 66 floors and contain about 600 units. Another Kingston Rd. 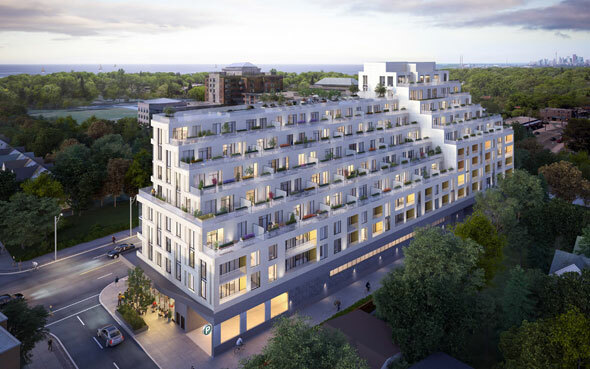 mid-rise, the Hunt Club building, like its neighbour to the west, promises lush lake views and decent, if not quite convenient, access to public transit (the Kingston Rd. and Queen streetcar termini are a 15-20 minute walk away.) The 8th floor penthouse units, which come with walk out rooftop patios, are priced at over a million dollars, so perhaps the lack of transportation links won't worry the future tenants of this neat, modern building. 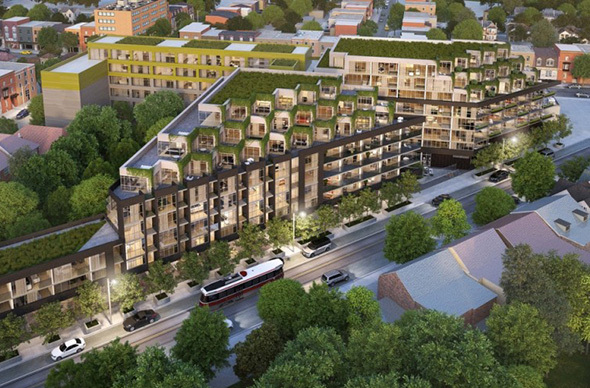 Located where the Dundas and Carlton streetcars part ways, the wedge-shaped Howard Park condo development will replace a cluster of unsightly car dealerships and panel beaters. When it's finished, the eight-storey, 96-unit property promises to deliver new retail space at street level, vine-covered terraces, a green roof, and high-tech heating and cooling facilities. Most importantly, the design is distinctive without imposing on the surrounding neighbourhood. You could hardly call the design of the Harlowe distinctive. 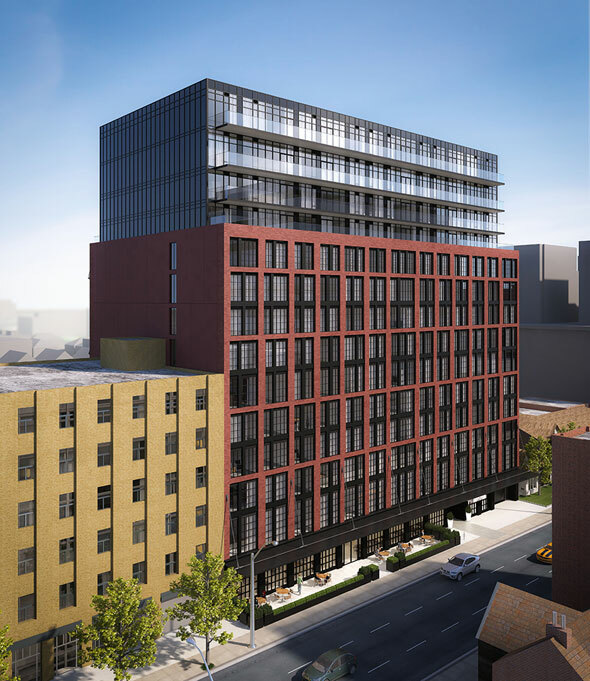 The rectangular brick building, which will eventually appear at Richmond and Bathurst, features little in the way of architectural flourishes. Instead, the designers of the Brad Lamb project have opted for classic stylings: warm brick, polished concrete, and big windows. The overall aesthetic is a nod to it's neighbour to the west, a pre-1947, six-storey residential building. Yes, the "Kip District" is a terrible name for a condo, but words aside this 28-storey development within walking distance of Kipling station sounds promising. Affordable units (starting in the low $200,000s) close to public transit should be in high demand as Toronto prices continue to climb. The catch: Dundas W. at Poplar is still some years away from being truly desirable for displaced downtowners. Any unit priced below $400,000 is considered affordable in glitzy, condo-heavy Yorkville, and so the second phase of the former Four Seasons hotel is hoping to tap into the group of condo buyers who can't quite afford to drop a few million bucks on a pied-Ă -terre. The architecture isn't anything to write home about, but this building is all about its Cumberland Ave. location, close to transit and every amenity under the sun.